It s not just about getting the patient through their surgery it s about getting them back to their old life. 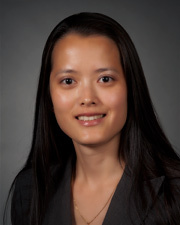 Dr. Pey-Jen (Jenny) Yu is a cardiothoracic surgeon at the Sandra Atlas Bass Heart Hospital, one of New York s largest and most successful cardiac programs. The Heart Hospital is continually recognized by third party organizations for having the best outcomes in various cardiac procedures. Dr. Yu performs a full spectrum of procedures, including coronary artery bypass surgery, traditional valve repair and replacement, and minimally invasive transcatheter aortic valve replacement (TAVR). As one of the Heart Hospital s younger recruits, Dr. Yu benefits from the most up-to-date cardiac training, especially when it comes to TAVR. Dr. Yu is also an active and accomplished researcher. She s especially interested in using Northwell Health s robust cardiac patient database to study the effectiveness of various treatments. This leads to better, more informed patient care across the department. Without curiosity and research, you re just practicing the same medicine over and over again with no progress, she says. Dr. Yu wanted to be a physician for as long as she can remember, and her passion for science began to flourish in high school. There she did research at the National Institutes of Health, especially around the AIDS epidemic, which solidified her interested in pursuing a medical career. Once in medical school, she was immediately drawn to cardiac surgery. It s a difficult field because of the time commitment and rigid schedule, but I tell prospective surgeons, If you can t imagine yourself doing anything but cardiac surgery, then you should be doing that. That s exactly how I felt. At the Heart Hospital, Dr. Yu is especially proud of the focused care and attention she and her team offer patients and their families before, during and after surgery. Patients really appreciate the time I spend with them throughout the entire process, she says. I treat the whole person including psychologically, socially and emotionally and try to make what they re going through easier. When she s not with her patients, Dr. Yu mentors residents as the associate director of the residency program at the Donald and Barbara Zucker School of Medicine at Hofstra/Northwell. She completed her own cardiovascular surgical training at NYU Langone Medical Center s flagship location, Tisch Hospital. She also trained at Bellevue Hospital and Manhattan VA Hospital, where she was exposed to and performed the full spectrum of cardiovascular surgery. Prior to that, she was a resident in General Surgery at New York Presbyterian Hospital Weill Cornell. Dr. Yu received her Doctor of Medicine from New York University School of Medicine.